Adding a Red Dot optic, or, commonly referred to as a Red Dot Sight to a modern polymer pistol such as a Glock, can be a daunting task without the proper parts, forcing you to either machine your slide, causing permanent and physical cuts from machining operation to the slide of your pistol and decreasing the resale value, and keeping you from adding another brand, make or different technology optic to your pistol as technology progresses. Do you really want to send your slide out, and have a huge path cut out of it? Unless it came that way from the factory, most people say no. Let's take for example the Burris Fastfire II, to the Fastfire III upgrade. When Burris changed the physical design of the optic, the Fastfire III was made slightly larger. Shooters who had already installed a Fastfire II on their handgun, and wanted to purchase and use the larger Fastfire III pistol, were left with no choice but to send their pistol out to a gunsmith or machine shop, once again, to have the slide machined to fit the larger Fastfire III mount. Luckily, the mounting screws for the red dot optic remained in the same location, and welding of the original screw holes, and drilling and tapping new screw holes was required in this case. But it still left people having to send their slide out, have it milled to a much larger area. Additionally, and perhaps the most important factor, by cutting the slide of your pistol to install a red dot optic, keeps you from ever returning the firearm to stock condition, and, if you ever want to change the brand, style or make of your optic as better red dot optics are developed. The JT Defense SOB Red Dot Optic mount, was developed to ensure an ultra stable red dot sight platform for shooters to mount their optic on, perform initial sight in, and never have to touch the optic adjustments again. The mount is so stable, that the only time we ever have to change the optic adjustments is when the optic is either mounted onto another pistol, or, a very different velocity ammunition is used, changing the sight in zero either above or below the original location. The mount has been drop tested, rubber mallet tested, and carried for days without the optic ever losing it's original zero. 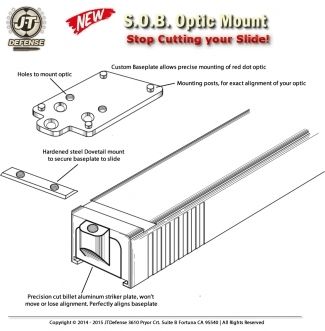 No other optic mount on the market can achieve such a stable and intimate lock in to the frame than the SOB Mount. 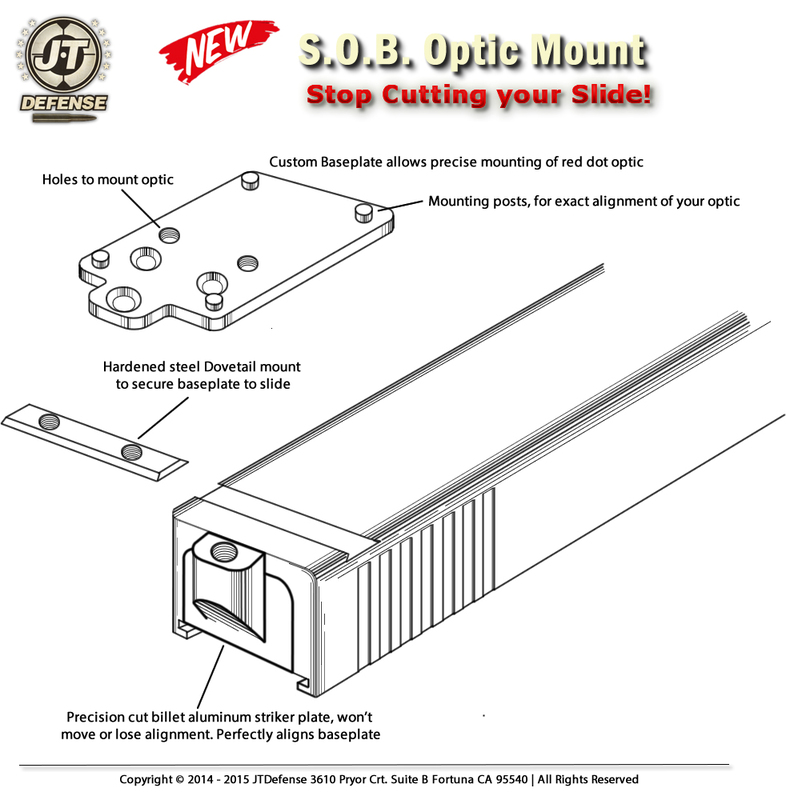 All other mounts on the market, specifically the single dove tail, will rapidly lose their tension on the 2 set screws, allowing the sight to move in the dovetail channel, and the optic will move and loser zero... even when locktite is used on these low cost two screw/dovetail mounts. The Red Dot optic mount for Glock manufactured by JT Defense, truly is the best way to mount any red dot sight to your gun. JT Defene's patent pending S.O.B. Optic Mount installs, without any modification to your firearm. Simply removing your open sight from your slide, removing the striker cover from the rear of your slide, and installing these three parts and 5 screws, is all that is necessary to install a red dot mount onto your gun. This revolutionary design, allows anyone to instantly and permanently install a red dot sight in minutes to their favorite handgun. 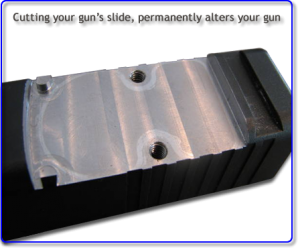 There's other ways on the market to do this, as we've discussed above, but there is no stronger way, including sending your slide out to a machine shop, to install a red dot. The 3 mounting locations on the SOB sight mount, work against each other, in opposing directions, pulling the striker plate up in the rear, while simultaneously pulling down on the mount from the front into the dovetail mount, keeping the mount from moving, even with the worst abuse. Let's quickly discuss "Co-Witnessing" for a moment. 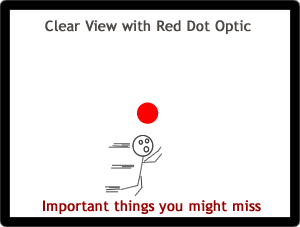 For a while, Co-Witnessing both the red dot optic having the same point of aim as the red dot optic were considered an important, because the shooter can simultaneously look at the red dot, and see the same point of aim as the open sights. 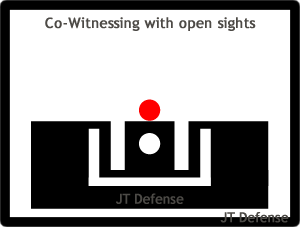 Usually, when co-witnessing, a larger, taller set of open sights are needed to make up for the taller red dot optic height, making holstering difficult in some holsters. Also, since the optic has to be milled out in front of the open sights, it is sometimes difficult to get enough room on some firearms between the opening of the chamber and the rear open sight. The JT Defense Red Dot optic mount comes with simply 3 parts, all made from 7075-T6 Billet aluminum, which physically is just about as strong as steel, yet much lighter weight. 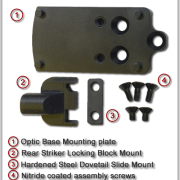 The optic mount also comes with 5 mounting screws,3 for the SOB Mounting plate, 2 to mount your optic to our plate. There are 2 short screws, that screw into the included dovetail replacement slot, and 3 additional screws. 1 screw for the rear of the plate into the striker replacement cover, and 2 additional screws to mount your optic to the SOB mount. You can see from the drawings, that the SOB mount diagram includes the parts, plus the location for these parts. 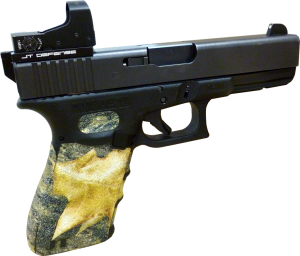 All parts included, fit to the exact tolerances of the Glock pistol, and are Cerakoted, for long life and durability in even the harshest conditions.